Graduates who donated to the senior class gift wore a blue contribution cord during the spring commencement ceremonies May 11. 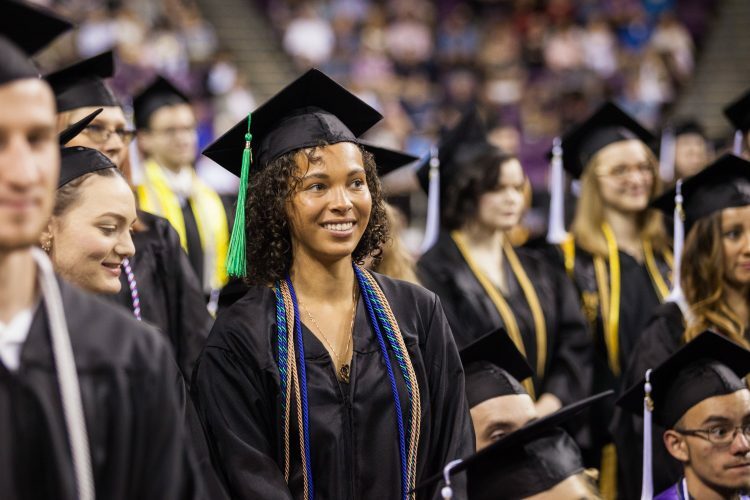 Members of the UCCS Class of 2018 donated a combined $5,885 to the senior class gift and benefited more than 30 scholarship funds in the process. Started by the Class of 2015, the senior gift has raised more than $25,000 for UCCS students. The goal for the seniors was participation, not a monetary amount, and to “pay it forward” for the next generation of students. The class saw 433 graduates donate with a 30 percent participation rate, much higher than national averages. Seniors who gave at least $10 wore a blue contribution cord during the commencement ceremonies May 11.